In Chinese this dessert is called 豆腐花 or 豆花, read as 'dou fu fa' in Cantonese and 'doh fu hua' in Mandarin, translated as tofu flower. 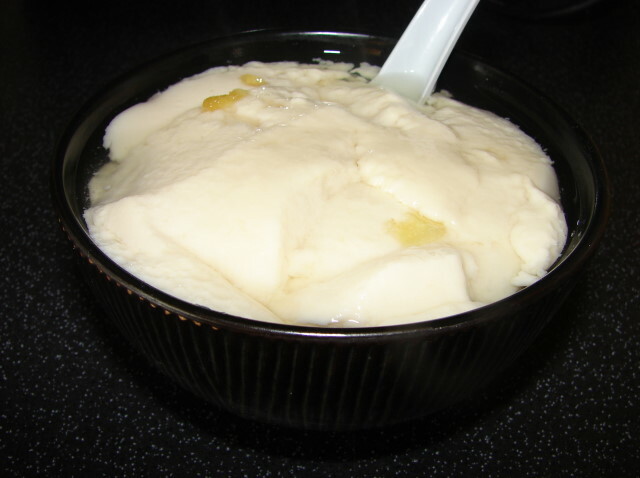 There is another name for this dessert called 豆腦 'doh now' in Mandarin, translated as 'soy brain' because it is as soft as brain and look/texture similar to brain. This soy milk curd is similar to the one used to press solid tofu. This recipe posted today is the traditional method using gypsum or plaster of paris or calcium sulphate to set the soy milk. There is one minor difference between this recipe and the one for pressing tofu, i.e. tofu fa also has cornflour (cornstarch) to help set the curd and making it less likely to bleed with water. The extraction of soy milk and boiling the milk is exactly the same as making soy milk. I love dou fu fa, it so soft and silky. Similar to a set yogurt without any sour taste. Love it anyday anytime. There are many ways to eat this soft curd sweet or savoury. Will give you some examples later. Here is the recipe how to make this traditional Chinese dessert. On the picture above, the yellowish bits are the ginger boiled in syrup. See this thread how to extract the milk and boil the milk. You may be able to use shop bought unsweetened soy milk, not sure with concentration though and also bought soy milk may contain preservatives which may affect the setting. You can try if you like but I won't guarantee the result. Boil the milk. * do get the gypsum from Chinese grocery store, do not use the plaster of paris from the DIY store. Try to measure the gypsum accurately, too much can make the curd texture coarse, to little the curd will not set adequately. Mix water with gypsum and cornflour. Once the milk is boiling with lots of bubbles, then gently simmer for another 5 minutes. Turn the heat off. Use a small clean sieve and dip into the milk, moving it about to remove any solids in the liquid and bubbles floating on the surface. Remove sieve and have a slotted spoon ready. Just before ready to pour the gypsum mixture into the milk, stir it vigorously again this is because gypsum can settle onto the bottom of the cup very quickly. Stir the hot milk with the slotted spoon while pouring the gypsum mixture from a height of about few inches from the liquid surface. When all in, give the milk a very quick stir again for about 1 - 2 seconds. Cover with the lid and leave it to rest without disturbing. The milk should set in about few minutes. Leave it for about 15 minutes before serving. Will stay hot for about 1 hour. 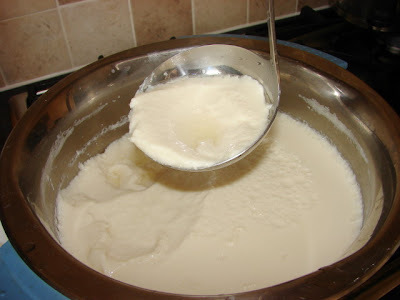 Using a ladle and scoop large lumps of this curd onto serving bowls. Small lumps can lead to curd bleeding with water. Can serve hot, warm or cold. The longer you keep this curd the more solid and rougher the texture will become, i.e. more water separated from the curd. Here is a pot of dou fu fa. Most common is with a gingery syrup. Boil 1-1/4 cup of sugar with 1/3 cup water and about 40 -50 g very thinly sliced peeled ginger. When the syrup is rapidly boiling, continue boiling for another 2 - 3 minutes, heat off and leave to cool. Spoon on as much syrup as you like. Another S E Asian flavoured syrup is boiling the same syrup as above, replacing ginger with few pandan leaves. Boil some soaked aduki beans till very soft with water, sweetened. Spoon cooked beans on the dou fu fa. Boil some skinned raw peanuts with water till softened then sweetened with sugar. Spoon this cooked peanuts on the dou fu fa. Sprinkle on Chinese red sugar on the dou fu fa. Spoon on some osmanthus flower syrup 桂花醬 on the dou fu fa. Make some sweetened black sesame thick soup 芝麻糊. Dry roast black sesame seeds, blend till very fine, add water or milk and cornflour/ground rice. Cook till thickened then sweetened with sugar. Then spoon on some this black sesame soup onto the dou fu fa. Sprinkle on soy sauce and some fried garlic and shallot in oil and ground pepper. Spicy Sichuan style called red oil doh hua 紅油豆花. Sprinkle on some Sichuan spicy dressing; made with chilli oil, Sichuan pepper oil, ground Sichuan pepper, soy sauce, black vinegar, pinch of sugar, roasted sesame seeds and spring onion. Brilliant. I love tofu fa, I must try this. Hi. Just wondering how does the packaging of gypsum powder (石膏粉) looks like from Chinese grocery store? Do you mind post a photo, please. I saw a few small containers with labels saying Lime Stone powder selling in Chinese grocery store. They come in either red or white and are from Thailand. Not sure if they are gypsum powder or not. Lime stone powder (white or red) is not gypsum. I don't think the packaging will list plaster of paris anymore. Last week I have seen smaller packet around 100g at my local Chinese supermarket. My four children are lactose intolerant so before Isomil or Nursoy came to Sibu I had to make my own Soy Milk. Starting from my second daughter we could buy the tinned soy milk. Every one of them had soy milk until they were about 3. Will use your recipe to make toufoo fah...thanks. Just leave the cornstarch out, don't substitute. Cornstarch is to make the dou fu fa more smooth and silky and less likely to leak with water 出水. Without cornstarch, the soy milk will also set to dou fu fa, must stir the gypsum and water thoroughly just before adding to soy milk. That is the method (without cornstarch) I used it to press dou fu. I will also post a different recipe using GDL 果酸 to set soy milk to dou fu fa. I think GDL is available Miri. You must be a worrying mum with children with dairy intolerance and carbo allergy. God bless! I'm in the USA and I can't find GDL or Gypsum powder. I saw one gypsum powder at asian store but it said not for food. Any help on website to purchase GDL and gypsum would really appreciated! For Gypsum try Chinese grocery stores or Chinese herbalist stores. Ask or look for 熟石膏粉 (sook sek goh fen). GDL will set at a lower temperature than gypsum. Personally I prefer gypsum than GDL for flavour and texture. I find GDL with a light sour taste and softer set. Hi there, thank you for posting the recipe for making tofu from scratch. I'm based in Australia and the Asian grocery store doesn't seem to have gypsum powder. Is there a substitute I can use to make tofu? Try any Chinese medicinal/herbal store, they may stock gypsum. Other coagulants you can use are Nigiri salt (Japanese method) or a chemical called Glucono delta-lactone (GDL). The last two may be more difficult to find than gypsum. Some people used lemon juice but I find this spoils the delicate flavour of tofu because it is too tangy. Just wonder if you have tried mading dou fu fa using Nigiri salt. If so, could you share your recipe? No. It's on my list to try.